Soboba has taken leaps and bounds from the small bingo hall it once was. After a complete remodel and exponential growth, today it boasts 2,000 slot machines, several table games, the largest HD video wall in the Inland Empire appropriately named the “Sobobatron,” and monthly promotions which feature extravagant prizes such as historic relics, custom cars, and tiny homes. To top it off, in celebration of their 21st birthday, Soboba will be giving away a brand new custom built backyard BBQ valued at $10,000 built by Lowe’s on June 25, 2016 at 10:00 PM one (1) winner will be drawn for the Grand Prize. 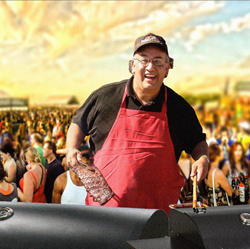 In addition, Soboba has partnered with “Famous” Dave Anderson and the Famous Dave’s Legendary Pit Bar-B-Que restaurants to bring the thrill of the grill to the casino floor. After spending 25 years tasting different barbecue flavors across the country and developing his own sauce recipes and smoking techniques, Famous Dave Anderson opened the first Famous Dave's BBQ Shack in Hayward, Wisconsin, back in 1994. In 1995 he was awarded the title of Best BBQ Sauce in America which secured the title of “Best New Restaurant” later that year. Since opening, Dave has won over 700 awards for his delicious BBQ. Now Soboba casino is bringing that award winning taste to their guests. Join the party on June 11th beginning at 1 PM. Famous Dave’s will be serving fresh BBQ at Soboba Casino’s 21st BBQ Birthday Bash. Tickets are $25 a piece and go on sale beginning May 25th. Each ticket includes lunch, a soft drink, a custom ‘Soboba Casino’s 21st Birthday Bash’ T-Shirt and the opportunity to meet Famous Dave Anderson live and in person.